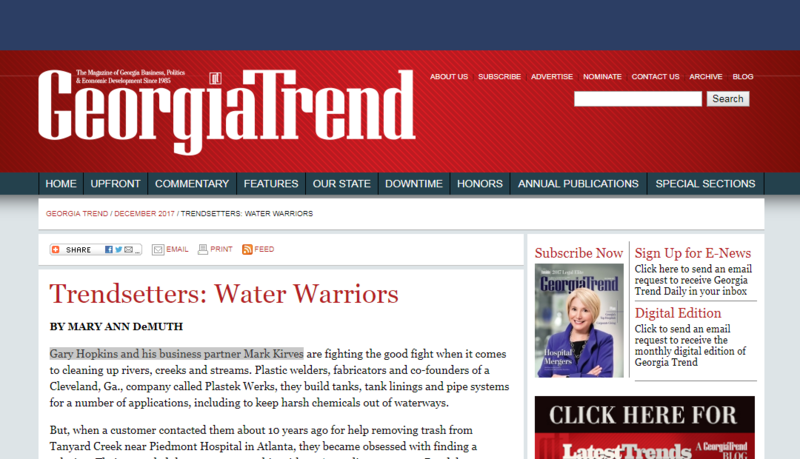 In a recent article published by GeogiaTrend, Storm Water Systems is featured as “Trendsetters: Water Warriors.” In the article, you will learn more about the origins of Storm Water Systems and how our products are impacting the nation. Gary Hopkins and his business partner Mark Kirves started Storm Water Systems about 10 years ago in an effort to solve a major problem facing the globe. Cleaning waterways by trapping garbage before it has a chance to wash downstream. Our revolutionary systems have been installed across the U.S. In Mobile, AL 30 dump trucks full of garbage are collected and removed each year from just one litter trap.